Occasionally visitors provide me with information regarding Chaparral matters that could be interesting for other visitors as well. That's why I start this page. I hope you'll enjoy this part! Disclaimer: The Chaparral Files will select and edit the subjects very carefully (but without discussion) to keep this website's editorial formula clear and focussed. If identifiable names or other personal data are essential, I'll only publish in full cooperation with the visitors concerned The Chaparral Files cannot be held responsible for any damage done but if a visitor wants his/her contribution being removed I'll do so as fast as possible. He has been into Chaparral since a small boy when he first started racing slot cars. Now, he is an artist and model maker and has produced a number of race car paintings including his favourite Chaparrals. Coen Mol mailed some of his slot race cars. This 2J body is totally DIY. It is mounted on an old Fleischmann chassis. "I enjoyed looking over The Chaparral Files very much, and seeing all the photos of the past! I am attaching a few photos of the 2J, with Vic Elford driving, that I took at the first Can-Am race held at Road Atlanta in Flowery Branch, GA, USA, in September, 1970. I think that the 2J DNF'ed in ths race, and Tony Dean won in a modified Porsche 908/ Chevrolet(?). You are welcome to publish them in The Files if you can use them, all I ask is that I be given photo credit. Thanks again for the memories! Tom Walker, Lawley, AL, USA"
Thanks Tom, great pictures. Especially the big one! Dramatic viewpoint. Look at the back skirt! Not exactly like the sliding Formula 1 skirts of the late Seventies. And the people near the tree in the background found themselves a very nice place.. And yes, Tony Dean drove a Porsche, but it was an endurance racer, equipped with a 3 litre Porsche engine. Tony Ferrari (what a name!) send me some 2H pictures he took in October 1969. That's exactly 40 years ago! Time flies.. He sais: "Here are the pictures. They are all from Laguna Seca with Surtees driving. The B&W is coming up the hill after start/finish and the color one is coming into old turn 9 (now 11). I have thrown in a picture of the 2J (after the engine blew up with Vic Elford driving) for good measure." Thanks for sharing your memories and pictures Tony. The side view picture reminds me of impressionists' art. Beautiful. And we have a better view through the window than Big John had! I captured another picture of his website www.tferrari.org (with Tony's permission) I guess it is in the early stages of the race because Surtees started from the 5th row but the 2H was already out on the opening lap because of problems with the crankshaft. This picture shows how dangerous road courses were at the time. A ravine just in front of us (you don't want to imagine what would have happened when someone left the road over there), tire markers, poles, pylons, sand, spectators along the track.. Just horrifying. I guess the unfortunate 2J was portrayed on Sunday morning (the following year of course) because in the warmup session the car suffered an engine failure. Nice picture though. The rear skirt is missing and it seems like the lower half of the back-end is covered with pieces of double sided adhesive tape or something like that. I have never seen that in books or contemporary literature. A certain Tom e-mailed about an article in Car & Driver of April 2009, called 'What Can-Am Could Have Been'. In my neighborhood a copy of this magazine is difficult to get so I tried the internet and here's the matching URL I found: www.caranddriver.com/reviews/hot_lists. Five new modern Can-Am concept cars, interesting stuff! As a taster, here's the Chaparral 3J, proposed by Jim Hall, illustrated by the great Mark Stehrenberger. Tom's commends about Hall's car: superb-looking coupe using 2005 V-10 F-1 drive chain, 1980's skirts and fans again, this time powered by a 200hp motor. Called the 3J, the car would be capable of speeds of 230mph and sustain 6g cornering power, 7g at speeds over 100mph. Too bad the drawing is red, rather than white. John S. - future model? 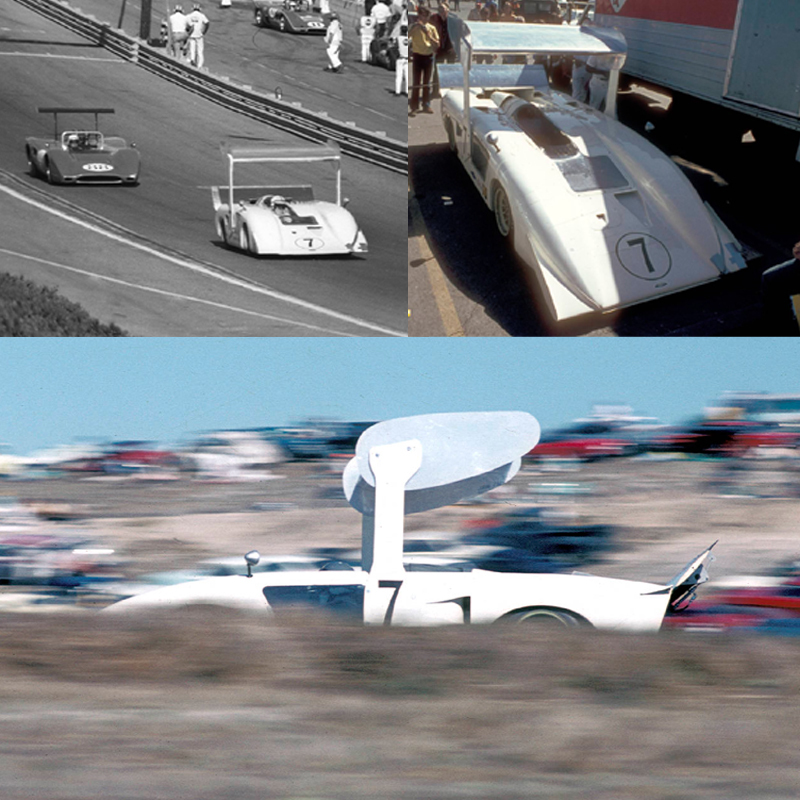 Former Chaparral engineer Paul van Valkenburgh is responsible for one of the other concepts. Spicy detail: his concept is a narrow car. Like the 2H..
A certain Ralph asked the following question by e-mail: Mechanic Franz Weis raced an open wheeled Chaparral in a few F5000 events before crashing at Lime Rock. What do you know of this vehicle? Well, after I sent him some information (from the Van Valkenburgh book) he replyed with some very rare pictures of the car, in racing action actually, at Donnybrooke Brainerd, Minnesota. I'd never seen these pics. The photographer responsible for this contribution to motor racing history appeared to be one Tim Winker (printed in the pictures). See website: http://winktimber.com/racecar. There you'll find the pictures and some more URLs finally leading to: http://www.oldracingcars.com/f5000. Choose the box "US 1971" and then choose "R7 Brainerd" and "R8 Lime Rock" and you'll get race statistics about the Chaparral F5000 and its driver Franz Weis. Great site! What do we learn? Franz did just two races with the car. He ended up 22nd after qualifying 21st at Donnybrooke but didn't even finish the first lap (after qualifying 13th) at Lime Rock because of an accident. In 1966 Chevrolet R&D produced a single seater aluminum chassis (G.S. 111) meant for the Indy 500. Because of internal political reasons the chassis couldn't stay in Detroit and had to be put away. It ended up at Rattlesnake Raceway because Jim Hall had showed some interest in the project. In the end he didn't do much with it either. When Hall closed down the racing activities at the end of the 1970 season, the car was still unfinished. So how did it go on? "Hall retained two of his most loyal mechanics, Troy Rogers and Franz Weis to maintain the shops and track, and to restore and store the remaining running race cars. They hadn't got racing out of their blood, however, and spend their spare hours preparing the old Indianapolis chassis (G.S. 111) for Formula A racing for Franz - which he subsequently destroyed in an accident at Mid - Ohio." Paul van Valkenburgh's captions beneath pictures of the car (at Donnybrooke 1971) read: "under the skin - a five year old Indy chassis". And Autoweek reported at Donnybrooke: The nose of Franz Weis' new Chaparral Chevy is unlike any other F5000 car, but then what would you expect to come out of Midland, Tex.? (see photo at Tim Winker's page). Was the car, when Hall inherited the project, complete with body but not yet prepared and sorted out? Or did Franz design and make a body for a bare chassis? I feel the latter makes the most sense. Just take a look at the aerodynamics! Certainly not 1966 style! In that case the car was more Chaparral than I always thought. And Franz did a superb job then, although the car aint white! Is this car perhaps the mysterious missing 2i between the 2H and the 2J??? Is Lime Rock Mid-Ohio indeed? Some time ago a visitor mailed the following url with this nice picture of the car: http://www.flickr.com/photos/felixdk203. Ronald, from Germany, had a question about the rear end of the 2A at Laguna Seca in 1964. He couldn't find a picture showing that particular view. And he was already in progress building such a car for an upcoming slot racing event in Nürnberg, Germany. 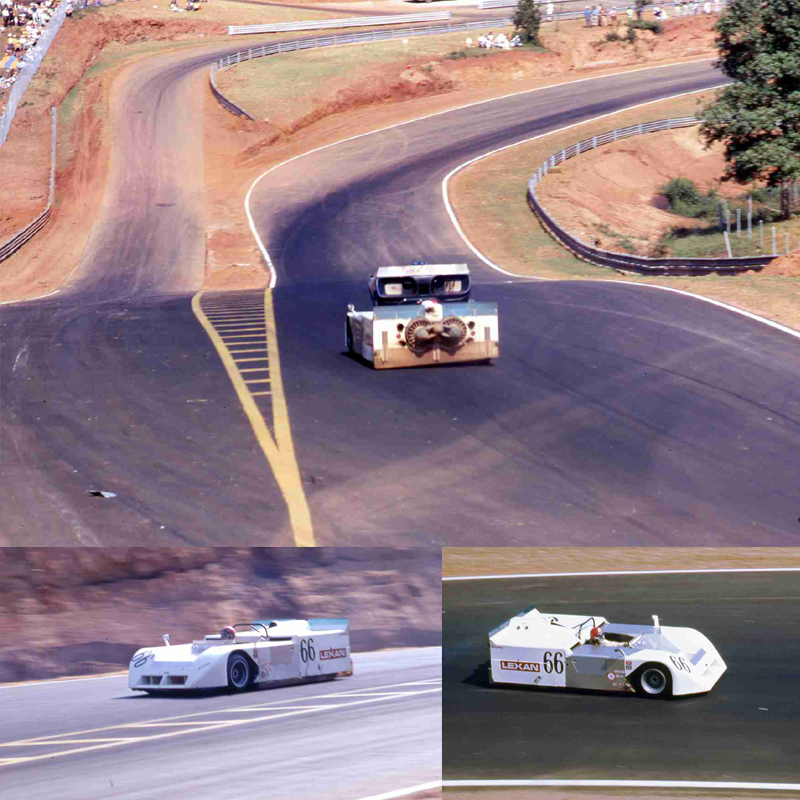 Of course he found The Chaparral Files but unfortunately I also didn't have the desired pictures in the archive! However, after some improvisation and creative thinking we both felt comfortable with the idea that the car's rear end presumably wasn't (much) changed between Watkins Glen '64 and Laguna '64. So I sent him some pictures of the Glen back end. At the left is what he produced, although it's not a shot of the back end either! For more information about his project visit http://fdp.holsterglen.de. Click Bauberichte and than Chaparral 2A. And now for that slot racing event: Look at www.ofenwerkring.de for all the details about this fantastic Chaparral dedicated event. Beautiful track, facilities and slot cars. Just look at this grid! All 1:24 scale Chaparrals (and a few related) cars. Mostly Fein-Design models and Phoenix Racecars. Fabulous! In 2009 there was a second Chaparral-only meeting at the Ofenwerkring. The beginning of a tradition? Patrick from France sent me some of his drawings. He's a real Chaparral enthusiast. If you want to contact him: carsartpatrick@orange.fr. Which engine did the 2D use for the two races it entered in 1967; Daytona and Sebring? Did it still use the 327 cu in engine or did it have the 427 engine like the 2F? How much did each model weight without fuel? Thanks for any information you can provide." I read your questions on the Chaparral site. Here's what I found: According to the book of Falconer/Nye: The 2D had the big 7 litre (427) engine at Sebring and Daytona in 1967. The car also had a 3 speed gearbox instead of the 2 speed used in 1966. The weight of the 2D in 1966 was 2035 lb (924) kg including fuel and driver. The 2A weighed 1650 lb with fuel and driver. In another book I found the dry weight of the 2A: 1200 lb. So a driver and fuel made up for some 450 lb. Conclusion: 2D (1966) ca. 1585 lb dry? The difference between a 2E with small block (1550 dry) and 2G with big block (1720 dry) was 170 lb. So 1585 + 170 = 1755 lb must have been the dry weight of the1967 2D. More or less the weight of the 2F. The dry weight of the 2F was 1750 lb (795 kg). 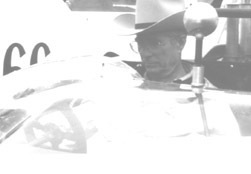 According to Pete Lyons in Cars in Profile #4 (December 1972) the weights of the 2A and 2D were generally as type F. He was probably wrong with the 2A, because it was an open roadster meant for sprint races (less fuel), and right with the 2D (with the big engine). So this is what I can provide you with. Success with your project." "Thanks so much for the Chaparral 2D/F information. That is exactly what we need to model the physics for both cars. We have been using the 7.0 liter engine for both cars until we got confirmation on the engine displacement. Although the physics are still in an early state, both the 2D and 2F are formidable cars. They are fun to drive and are easily the quickest of the cars we are using...the others are the Ford GT40 Mk I, IIB, and IV, the Lola T70, the Ferrari 330/P4, the Mirage M1, and the Porsche 910. No wonder that the real world 2F did so well at qualifying even though it's reliability was suspect." Look at http://www.sportscarlegends.net to have a look at this project. Lee: "Right now, we only have a front end for the website and there is no downloadable mod file yet for the general public, but you can see where we are headed. It has not been updated in long time however. Click on the green arrow at the lower right to move to the next pages. Here are a couple of screenshots that show the Chappies as currently depicted by the sim."